Expanding opportunities for residents in low-income communities is the focus of community development financial institutions (CDFIs). These mission-driven institutions prioritize social, economic and racial justice for underserved communities over and above profits, meaning that CDFIs invest in places and projects that traditional lenders are often reluctant to support. Central to that effort is working to partner with and empower communities to identify locally driven and sustainable solutions that help address their most pressing needs. 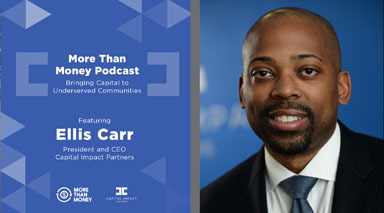 More Than Money, a podcast that explores how “we can use our values to inform how we engage with our work and invest our wealth,” recently sat down with Ellis Carr, president and CEO of Capital Impact Partners, to discuss the organization’s approach to community development and the role of CDFIs in communities. Listen as Ellis talks with host Dawn Carpenter about our values and how we work as market maker and market catalyst to help communities thrive. We also invite you to read the full transcript below. Welcome to More than Money, a podcast that explores how we engage with our work and invest our wealth. I’m your host, Dawn Carpenter, and for the next 30 minutes we will explore what our work and wealth means to us and to others. Our guests share their personal stories of why they work and how they engage as fiduciaries of the material world. Welcome to the More than Money Podcast. I’m your host, Dawn Carpenter. And for the next 30 minutes we are going to be on a journey to look at how capital is brought to underserved communities. We are going to be joined in the studio today by the CEO of Capital Impact, a CDFI, yes, more acronyms in this world. CDFI means Community Development Financial Institution. CDFIs are special financial organizations, be they loan funds or regulated banks or financial institutions, who have a special commitment to deploying a large portion of their lending capital into underserved communities. They are designated as such by the U.S. Treasury Department, and some work locally, but today we’re going to hear from Capital Impact, who happens to be located in the Washington D.C. market but is working all throughout the country. And to complement our conversation about CDFIs with Capital Impact, we are going to hear from one of the users of capital from Capital Impact, Axis Health, a community health provider in the Bay Area of San Francisco, California. Community Development Financial Institutions, or CDFIs as we call them, share the common goal of expanding economic opportunities in low income and low wealth communities. They do this by providing access to financial products and services for residents and businesses in those disinvested communities. Now CDFIs can be banks, credit unions, loan funds, microloan funds, or even venture capital providers. But what they have in common is that CDFIs are helping families finance sometimes their first homes, by supporting residents who are starting or expanding their businesses, and investing in local health centers, schools, or community centers. The goal of CDFIs is to foster economic opportunity and revitalize neighborhoods. Now today, we have with us in the studio Ellis Carr. Ellis is the President and CEO of Capital Impact Partners. Capital Impact Partners is a CDFI and is headquartered in Arlington, Virginia, and whose ambitious agenda is anchored by four strategic pillars; addressing systematic poverty, building equitable communities, creating healthy communities, and ensuring inclusive growth. Dawn Carpenter: Ellis Carr, welcome to the More than Money Podcast. Ellis Carr: Thank you, Dawn. I’m really happy to be here. Dawn Carpenter: Excellent. Well, let’s get started with a bit about your background and the history of Capital Impact Partners. Ellis Carr: Sure. So, Capital Impact is a national nonprofit CDFI, and as you mentioned, we’re headquartered in Arlington, Virginia. We have offices, although, in Oakland, California and Detroit, Michigan. Our mission is to help people and communities break the barriers to success, and we accomplish that by providing financing and technical assistance to help expand access to quality healthcare, education, housing, and food. We got our start a little over 30 years ago, at a time where high interest rates, inflation, unemployment had a disproportionally adverse effect on low income communities. And we leveraged the co-op model, the cooperative model, as a means of increasing economic participation, and also a way to build community wealth. We still do those things today. Since our inception, I’m really happy that we’ve been able to invest over $2 billion in communities across the country, and we currently have about $800 million in assets under management today. Dawn Carpenter: Well, how does your CDFI fit in the financial ecosystem? What are the sources of capital, how do you evaluate risk and return, and probably most importantly, impact? Ellis Carr: Great questions. I’ll start with the first one. So, Capital Impact, and CDFIs like it, primarily serve a group of people that are currently not being served by mainstream financial institutions. And for that reason, we play three distinct roles in communities, the first as a market maker. Capital Impact and CDFIs like us, are often market makers because we oftentimes work in the distressed community that has a need that’s not being fulfilled by an existing product or service. And that’s where Capital Impact, and CDFIs like us, that then partner with residents in that community and create tailored resources to address that need. I think the second role we play in the financial ecosystem is as a market catalyst. Because we can’t and don’t do our work in a vacuum or alone, we develop public private partnerships that combine capital that invests federal dollars alongside with private sector capital from larger institutions. And we’re able to do that because we’re imbedded in communities and we have a strong track record, and the ability to de-risk a transaction for a large and, frankly, regulated institution, so that we can bring the much-needed resources into communities that may not otherwise have those resources. And then, I think the third way that we play, and this has been an evolving role for CDFIs, is what we call the role as a community quarterback. And that really is effectively an organization that brings people together, articulates the vision, aggregates capital, and aligns efforts from multiple parties or stakeholders towards the common goal. I think a good example of that would be some of the work that we have done across the country, around developing strategies that really help build healthy communities. And you talked a little bit about kind of our four strategic pillars around equitable communities to have access to quality schools, quality and affordable housing, and options for healthcare and healthy food. In terms of capital, we get our capital from a variety of sources. Primarily, we get our capital from; we both raise both debt and equity, and because we’re a nonprofit equity translates into grants from really a few key sources; large financial institutions and banks. Larger financial institutions would be pension funds and banks, foundations, government, from the federal government and state government, and also from individuals, and we do that effectively. And that gets to your other comment question around looking at risk and return and impact. We are able to combine those sources to provide solutions that work for the community, that imbed most of the benefit of the work that we do into communities, while also encouraging private investment into those communities as well. And so, we evaluate risk and return much like all of our traditional financial services organizations would, but we also look at impact. And impact is kind of our reason for being, and so that really is one of the primary ways that we look at the transaction. We look at it holistically, but we tend and can take more risk because impact is first and foremost. I think it’s also important to say from our return perspective that we are profitable but we’re not profit maximizing. So, that allows us a good amount of flexibility to be able to really push for impact and ensure that we’re imbedding the right benefits and the right controls in place in the community. Dawn Carpenter: Well, that’s a whole lot to accomplish. What type of skills do your bankers have to have to do this work? It sounds like you almost have to be magical storytellers. Ellis Carr: So, I would say first and foremost you have to have a passion for the mission and for helping others. To your point, you have to be extremely communicative, and the ability to interact effectively with a ranging group of people from residents in the community, to community leaders, to bankers on Wall Street. You have to be able to communicate effectively with them and so speak the very languages that each one of those constituencies can relate to you. I think that you have to be able to multitask, right? We are an organization of about 80 folks, and so we have to wear multiple hats. And so, having the ability to multitask is critical. As well as having great analytical skills. Because we are kind of a hybrid between a traditional financial services organization, and also fighting for social and economic justice in these communities, that’s not a typical role that you can find just anywhere. And so, we have been really focused on developing an associate program here at Capital Impact that really helps people to come in and understand credit, understand the sectors we work in, and how to lend to them. Dawn Carpenter: Well, on that note, how does your private sector background, how has that prepared you for the work that you do at Capital Impact? Ellis Carr: Sure. I mean, I have been fortunate to work for a few great companies before I came to Capital Impact, and held positions in operations, corporate finance, strategy, and capital markets. And I think I’ve been able to leverage all of those experiences at Capital Impact. I think for me, one of the most important things that I’ve been able to leverage from my background is, what I’ve just mentioned, the ability to speak and be conversant in multiple different constituencies, specifically, kind of to our Wall Street investors and our large investors. Because it’s important for them to have the confidence to invest in us as a financial intermediary so that we can more effectively do our work on the ground. So, ensuring to them that we have the right procedures and protocols in place, and also have the right skillsets to be able to do the work we have, has been truly important. And I’d say, also, just working for larger organizations you get a really good understanding of best practices across the continuum of business that we’ve been able to implement effectively here at Capital Impact. Dawn Carpenter: Well, I’ll tell you, measurement is key. So, how do you measure the success of what you’re doing, and what’s some of the work you’re most proud of? Ellis Carr: Great question. So, I think we measure our success in two ways. The first, and I mentioned this earlier, is impact in the community; and the second, is financial sustainability. Again, our reason for being and for doing what we do is to create real and true long-lasting impact in communities. So, we measure and evaluate both the outputs; i.e., the number of school seats that we create and the jobs that create in communities. But we also look at the outcomes; things like the number of students who graduate from high school, and also go on to graduate from college and are able to give back to their communities. We also kind of look at financial self-sustainability as well, which means that we need to be profitable. While we’re not, again, profit maximizing we also recognize that for us to continue to invest in communities like we are, we need to ensure that we also reinvest in Capital Impact so that we can double-down and do the things that we do across the country. Dawn Carpenter: Kudos to all of you because you’ve been doing some extraordinary work. But you know, before I let you go, I would be very remiss by not telling you that we’ve snagged one of your biggest fans for the next segment here on the More than Money Podcast, Axis Community Health from the San Francisco Bay Area. Now tell us, what about the project with the Axis Community Health Partners best illustrates the work that you’re doing at Capital Impact? Ellis Carr: I think I’m really proud of the work that we’ve been able to do with Axis. They provide critical healthcare resources for low income residents around them. And what I’m most proud about with that is the number of people that now we are able to help provide access for, healthcare access for, but also Axis is doing things and providing dental resources, and also mental health. All those things are significantly critical in underserved communities and really help for people to thrive, people to be able to go to school and to get a great education, and also for people to go to work. So, I’m really happy that we were able to work with them and think they have been doing a fantastic job. Dawn Carpenter: Well, kudos, again, to all the work that you and your colleagues are doing. Now where can our listeners find you on the web? Ellis Carr: So, we are, we have our own YouTube channel, but you can find us at CapitalImpact.org. Dawn Carpenter: Excellent. Well, I urge all of our listeners to go out and learn more about the good work of Capital Impact. And Ellis, thank you for joining us on More than Money. We hope to have you back soon. Ellis Carr: Thank you, Dawn.